This Soft and light Chocolate Chip Banana Muffin is a gluten-free simple recipe for those who are in a gluten free diet, but can also be easily converted to regular muffin for non-gluten free eaters. Whichever team you belong, I got you covered guys. Today I’m giving you a gluten-free Muffin for those who are on gluten-free diet. I’m not on a gluten free diet at all, but I like trying new things, and new food and new way of making and preparing foods. But most importantly, for me it’s being able to give other people who are on a gluten free diet an option when it comes to enjoying regular food and bake products that we (non-gluten free eaters) enjoy. I’m totally new to gluten free baking, but I really enjoy the challenge of making a gluten free baked products. So I’m not going to give a long speech about being on a gluten free diet and how to stick to it, because I am seriously the wrong person for that job. But what I can do is to share with you simple, delicious gluten free bake products, and I am starting with basic Banana Muffin recipe, gluten free way. What made this Banana Muffin gluten-free? I’ve substituted regular all-purpose flour with a combination of Almond Flour (Almond Meal) and Brown Rice Flour. I used Bob Red Mills for both, this brand is my go to brand for non-standard types of flour. The quality is really exceptional, although they are quite expensive but it’s worth it. You can certainly use another brand that you trust, it’s your call. Based on my research, it seems that making a gluten-free baked products simply requires a substitution of dry ingredients (normally flour) for a gluten-free ingredients. It’s not as tricky as making Vegan baked products as gluten free doesn’t care in using dairy products which is almost all the time present in any bake products. This is why it is very important to use a good quality replace ingredients, in this case replacement for flour. Replacement flour could have different texture, Almond flour for instance has a very grainy texture which makes baked products crumbly and loose. I also noticed that it doesn’t absorbs liquid as much as other flour replacement (white rice, brown rice flour etc). This means using all Almond flour could possibly means using less liquid in form yogurt or sour cream, eggs, butter, milk etc. Anyway, bottom like get to know the substitute ingredient you are using because moisture level of substitute flour varies. This muffin has a soft texture and not the usual dense kind of muffin. This was achieved from beating the egg and sugar until it gets to the pale color and very smooth runny consistency. Beating these ingredients incorporates air into the mixture thus making it lighter. This muffin is also moist, thanks to the banana and the yogurt it stays soft even when left in the refrigerator for few days. The sweetness level is just right to my liking. In my first attempt, I used 1/2 cup sugar and it turned it sweeter than what I want it to be although some of my friends love it that way. In my second attempt, I reduced the sugar to 5 tbsp (1/4 cup + 1 tbsp), that’s about a little bit more than 2 tsp sugar per 1 piece of muffin which I find perfect. It you want it sweeter, you could go 6 tbsp. This muffin taste great for a gluten-free version. I hope you’ll give it a try. Why do we need to bake at 400F and 350F? I had been baking most of my muffins when I was starting at 350F all throughout, until I encountered a post discussing baking temperature for muffins. To summarize the story, baking in first 5 minutes at 400F will allow the muffin to rise fast thus making the muffin taller and will help the muffin build the structure. Then baking the muffin at 350F will then allow the muffin to hold and sustain the structure without burning it. This trick works, but you still have to be mindful of the length of baking time. Under baking the muffin could make the center sink. Don’t shy away from this recipe just because you don’t care about eating gluten-free bake products. Well, good news is this recipe can easily be converted to regular muffin recipe using regular flour. Simply replace almond flour and brown rice flour with the same amount of all-purpose flour, it’s that simple. Life goes on as usual, the other ingredients and instructions remains the same. What makes this different from other banana muffin? Banana bread is a quick bread, and often times most of the recipes I saw doesn’t use a mixer to make it. Traditional banana bread are heavy and dense, that is not a bad thing. In fact, that was the texture that I only knew until I got into baking and tried experimenting on my own. Although I also like that kind of texture from time to time, I discovered that a lighter and softer banana bread or cake or muffin is something that I enjoy more. My Banana Chiffon Cake has a lightest and softest texture and it absolutely delicious. That cake uses a method of separating egg yolk and egg whites, the same method I used for Banana Walnut Sponge Bread. Those 2 have a sponge and chiffon like texture. This Banana Muffin is a cross between the texture of traditional and chiffon like texture. I was actually surprised how good it turned out. The method I used here is to cream the sugar and egg to build up air and to create lighter texture. I then added mashed bananas and dry ingredients came in last so that it will only require less mixing to avoid dense bread. Just a simple modification in the method gave me the soft and moist Chocolate Chip Banana Muffin. Although this is a simple recipe, there are key things that you have to remember to get a nice soft banana bread texture. Ripe Banana – only use ripe banana, the one with brown spots in the skin is the best one to use. Those brown spots are sign that the banana is ripe, and ripe means softer and sweeter. This is the state of banana that would give the natural sweetness to the banana bread or muffin. Now if you don’t have ripe banana, I’ve read that you can bake the banana wrap in foil at 300F for 10 mins to get it soft, however I personally haven’t tried that. I always prefer either buying a ripe banana ready to use for banana bread or buy a banana and let it ripe naturally in my kitchen counter. One thing to remember, the warmer the place you keep the banana, the faster it will ripen. This is why input my banana in the fridge specially during summer if I don’t want it to ripen fast, and I also wrap the end with the stem with a cling wrap. That will block the air from coming in and it will slowdown the ripening process. Don’t over mix – You’ve heard this over and over again in many recipes but I will still repeat it here. Over mixing can make the bread though because as you mix more, gluten is form and that causes a tough bread. Once you add the dry ingredients just mix it until combine, no more no less. Creaming Egg & Sugar – Although not a traditional process in making banana bread, creaming egg and sugar instead of just mixing everything in one bowl gave a lighter banana muffin texture. So don’t skip this step and see for yourself why I recommend doing this. Creaming the egg and sugar will allow air to build up into the batter thus giving a lighter and airy texture, almost like a cake but still feels and taste like banana bread, but better. Pre-heat the oven to 400F. Line a muffin tin with muffin liner or spray with oil. Mash the Banana: In a small bowl, mash the banana. You can use a fork or immersion blender to do this. Add in yogurt, vanilla extract and baking soda. Set aside while you make the muffin batter. Beat Sugar and Egg: Beat sugar and egg until pale in color and smooth and runny consistency. Like this. Sugar & Egg + Banana Mixture: Add in banana mixture and mix until just combined. Dry Ingredients: Add almond flour, brown rice flour and salt and mix just until combine. Add-In: Add chocolate chips and manually mix just to combine. Divide the Muffin Batter: Divide the batter into 6 muffin tin with muffin liner. Bake at pre-heated 400F for 5 minutes then lower the temperature to 350F and bake for another 18 minutes. That would be a total of 23 minutes. Remove and transfer in a cooling rack. 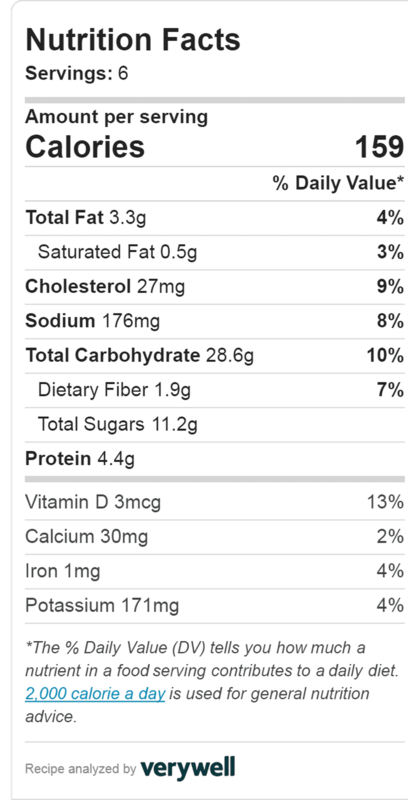 Nutrition Information was calculated using Veryfitwell Recipe Calorie and Nutrition Calculator. For details about Nutrition Information in this website, please read the Disclaimer page. Here are some other banana recipes, check them out!